Let no hero be forgotten! That is the motto of Operation Care Package, a volunteer organization with the goal to support our Soldiers, Marines, Sailors and Airmen through care packages and letters of encouragement. There are many ways you can use your super sewing powers to help our soldiers through Operation Care Package, from sewing something with love to writing a letter of encouragement or packing a care package. First, visit the American Sewing Guild’s Community Service page, and scroll down to find the free US Troops Drawstring Bag tutorial, made specifically for OCP. Stitch up a bag or two (or get your friends involved to sew more!). Visit the Supply List at OCP to find out what items are most needed/requested to fill the care packages, and then find a drop off location near you. Or, visit the special Campaign for Handmade Items page at OCP to find what specific projects you can make that will directly support a deployed soldier. Specifically, holiday stockings, neck gators and cooling scarves are needed this year, and each item on the Campaign for Handmade Items page includes thorough instructions for making each item. 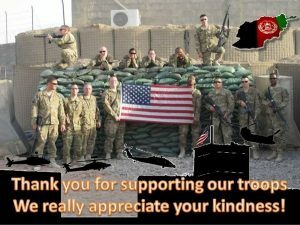 These care packages and handmade items can give our troops stationed far away a little encouragement and a taste of home!